Please note that our Jackpot now stands at a Whopping €9,900. Now is the time if you are not already signed up to register. Not only are you helping your club but you are in with the chance of a great win. There was no Match 4 winner of the Club Lotto on Friday, 3rd October when the numbers drawn were 7, 16, 21 and 30. It is €2 per week but goes a long way towards running all the facilities that we have. Claire Benson gets the lucky dip. Further details are available at www.brayemmets.com. Bray Emmets 2-09, Glenealy 1-11. Yes we are County Champions. What a day and what a game. This was a game that had everything in it. It’s hard to single anyone out as this has been a campaign of more than 15 players however Christy ‘Jackie’ Moorehouse deservedly got man of the match. It has been a long time coming and this management team and squad of players have got themselves in to the history books and brought great joy to so many as well. It was great to have the support that we had on Sunday and the club have received plaudits from officials who felt it was one of the best county finals in years. We hope you join us on the road as we now enter the Club All Ireland Campaign. 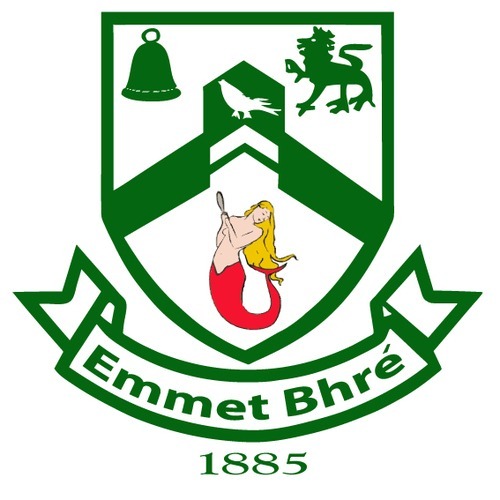 Emmet Bhré 2-5, Carnew 1-1. Great win for the Junior hurlers who won the Junior ‘A’ championship, Sun 5 Oct. As team Captain, Luke O’Reilly said in his acceptance speech, this was a win they dedicated to Declan Molloy. Cillian and Enda are two highly respected members of the team over the years and were generously there for the team on Sunday. Comhghairdeas mór le gach duine as an mbua croíúil seo. Foireann : Barry Cowan, Conor McNally, Paul Barry, Seanie Maloney, Billy Brazil, Enda McHugh, Jordan Lee, Cathal Reddin, Matt Thompson, Mick Walsh, Eoin McCormack, Ryan Tynan, Craig Brack-Sinnott, Luke O’Reilly (Captaen), Shane Anders, Barry Cunningham, Danny Eglington, Eoin Fox, Ben McCormack, Bill Moorehouse, Brian Duggan, Peter Conroy, Colin Salmon, David Ebbs, Robbie Mason, Alan Sweeney, Willy Robinson, John Ward, Brian Lambe, Billy Brazil, Daniel Kennedy. Bainisteoir – John Ward, agus Pat Lee / John Anders ag cabhrú leis.